Mahindra and Mahindra has launched new Mahindra Thar 2012 new model with Air-conditioning and heater and better performance 2.5 Litre turbocharged CRDe (CRDI Diesel Engine) engine with an all wheel or 4×4 drive. The new CRDe Engine is a BS4 compliant engine with about 105 BHP Horse power at 3800 RPM and whooping 247 Nm of torque delivered between 1800 to 2000 RPM range. The new Mahindra Thar 2012 comes with Air conditioning and engine immobilizer and costs about Rs. 87,000 more than the older version. The new Mahindra Thar 2012 with new engine, engine immobilizer and AC has been priced at Rs. 6.86 Lakhs ex-showroom Delhi. The new model offers AC and engine mobilizer as standard while additional features like Fog lamps, alloy wheels, seat covers, central locking etc. can be purchased as separate accessories. Earlier the AC was not a part of the standard package. Some of the interesting features which make Mahindra Thar a good off-road capability includes sturdy design, robust engine, high torque, low gear ratios, load sensing brakes, drive by wire technology in throttle, large 9 inch booster with front disk brakes and rear drum brakes with 4WD low and high gears for controlling traction in a better manner. For better off-roading, Thar offers independent front suspension while the rear wheels have elliptical leaf spring suspension. It rides on 16 inch wheels with tubeless tyres with profile of 235/70 for good grip. Thar also features high approach and departure angles to take on rough terrains without worrying about it. It also features bucket seats at front which helps on not so even terrains, offers power steering for comfort, a short turning radius of 5.25 meters. 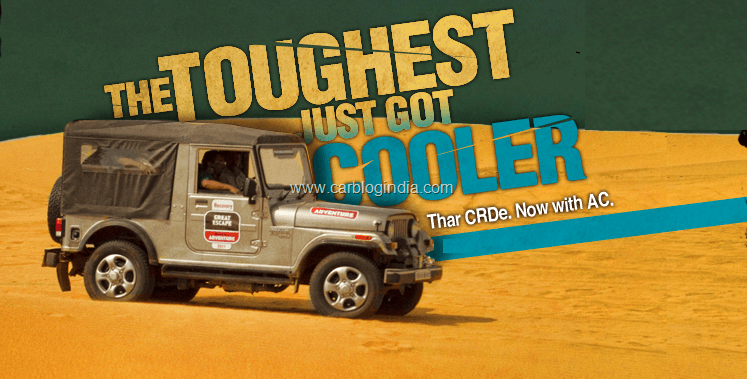 So if you are an off roading enthusiast, you may no longer sweat on your next off-road journey in an AC Thar.